The research is definitive: families raising children with autism are highly stressed. This makes it vital for professionals to understand the individual needs of families to prioritize interventions that fit their needs. Family Quality of Life (FQOL) assessments can provide a vehicle for productive family-professional conversations that serve as a starting place from which both need and strength can be identified. 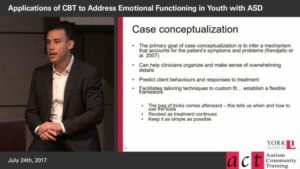 This presentation introduces the core concepts and research findings related to FQOL, with particular attention to families of children with ASD. The information will be relevant to families, professionals, and policy makers. Grace Iarocci, Ph.D., R. Psych. 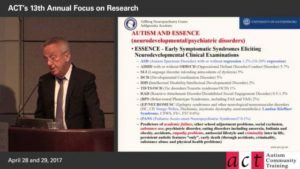 is associate professor of psychology at Simon Fraser University, and the Director of the Autism and Developmental Disorders Lab. 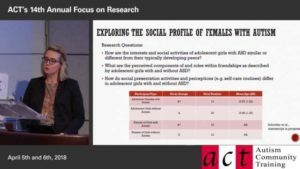 She is also a Michael Smith Foundation for Health Research Scholar and a faculty mentor of the Autism Research Training Program (ART) and a registered psychologist who specializes in the diagnosis and treatment of ASD. Emily Gardiner, M.A. is a Ph.D. Candidate in the Department of Psychology at Simon Fraser University. She is a member of the Autism & Developmental Disorders Lab. She is particularly interested in research on quality of life for families of children with ASD. Emily has been involved in research investigating how individuals with ASD are perceived by their college-aged peers, as well as the link between executive functions and social competence in individuals with ASD.